Mammoth Lakes is a town in Mono County, California, the county's only incorporated community. It is located 9 miles (14 km) northwest of Mount Morrison, at an elevation of 7,880 feet (2,400 m). As of the 2010 United States Census, the population was 8,234, reflecting a 16% increase from the 2000 Census. The Mono people were the first settlers of the Mammoth Lakes area, thousands of years ago. They settled in the valley but traveled by foot to other lands when trading with different tribes. The European history of Mammoth Lakes started in 1877, when four prospectors staked a claim on Mineral Hill, south of the current town, along Old Mammoth Road. In 1878, the Mammoth Mining Company was organized to mine Mineral Hill, which caused a gold rush. By the end of 1878, 1500 people settled in the mining camp called Mammoth City. By 1880, the company had shut down, and by 1888, the population declined to less than 10 people. By the early 1900s, the town of Mammoth was informally established near Mammoth Creek. The economics of the original town was based on logging and tourism. The first post office at Mammoth Lakes opened in 1923. In 2004, the Mammoth Ski Museum opened in town. The museum featured many vintage artifacts, photographs, and posters. A movie documenting the life of the founder of the ski resort (Dave McCoy) and those of early famous skiers in the area is shown. In 2010, photographs taken by Dave McCoy were featured in an exhibit at the museum. In 2008, after a jury trial, the Mono County Superior Court entered a $43 million judgment against the Town of Mammoth Lakes for breach of a development agreement. The California Court of Appeal, Third District, affirmed the judgment in December 2010, and the California Supreme Court declined to hear the appeal on March 23, 2011. On Monday July 2, 2012, Mammoth Lakes filed for bankruptcy in the face of the judgement. Later the same year, the bankruptcy was dismissed as a result of a settlement between the town and their largest creditor. Mammoth Lakes lies on the edge of the Long Valley Caldera. The area around the town is geologically active, with hot springs and rhyolite domes that are less than 1000 years old. Visitors can take State Route 203 from the town of Mammoth Lakes to the Mammoth Mountain Ski Area, over Minaret Summit, then down to Devils Postpile National Monument, with access to the Ansel Adams Wilderness. The town is surrounded by mountains: on the west, Mammoth Mountain looms over the town, while to the south, the Sherwin Range dominates the view. This hilly terrain and the high altitude makes the area great for high-altitude athletic training, including among elite long-distance runners, who live and train in the thin air. The town is surrounded by acres of forest and is bordered by the Ansel Adams and John Muir Wilderness Areas. The eastern entrance of Yosemite National Park is located 32 miles (51 km) north of town. The town is situated in the southwestern, mountainous part of Mono County, California. Mammoth Lakes has a warm summer mediterranean climate (Köppen: Csb) or a rare dry-summer continental climate (Dsb) for the 0 °C isoterm, with long, very snowy winters, and warm, dry summers. Snowfall is particularly heavy from December through March, and averages 206 inches (5.23 m) per season. On average, there are 21 days of 80 °F (27 °C)+ highs, twenty-one days of highs under 32 °F (0.0 °C) and 4.6 nights of sub-0 °F (−18 °C) lows annually. The population was spread out with 1,719 people (20.9%) under the age of 18, 1,050 people (12.8%) aged 18 to 24, 2,833 people (34.4%) aged 25 to 44, 2,100 people (25.5%) aged 45 to 64, and 532 people (6.5%) who were 65 years of age or older. The median age was 32.6 years. For every 100 females, there were 121.4 males. For every 100 females age 18 and over, there were 127.0 males. As of the census of 2000, there were 7,093 people, 2,814 households, and 1,516 families residing in the town. The population density was 286.2 people per square mile (110.5/km²). There were 7,960 housing units at an average density of 321.1 per square mile (124.0/km²). The racial makeup of the town was 83.21% White, 0.41% African American, 0.49% Native American, 1.27% Asian, 0.13% Pacific Islander, 12.35% from other races, and 2.14% from two or more races. Hispanic or Latino of any race were 22.20% of the population. There were 2,814 households out of which 28.4% had children under the age of 18 living with them, 43.3% were married couples living together, 6.0% had a female householder with no husband present, and 46.1% were non-families. 28.3% of all households were made up of individuals and 2.3% had someone living alone who was 65 years of age or older. The average household size was 2.44 and the average family size was 3.09. In the town the population was spread out with 22.5% under the age of 18, 13.3% from 18 to 24, 38.4% from 25 to 44, 21.5% from 45 to 64, and 4.3% who were 65 years of age or older. The median age was 32 years. For every 100 females, there were 131.9 males. For every 100 females age 18 and over, there were 141.2 males. The median income for a household in the town was $44,570, and the median income for a family was $52,561. Males had a median income of $31,280 versus $25,106 for females. The per capita income for the town was $24,526. About 8.7% of families and 14.4% of the population were below the poverty line, including 14.9% of those under age 18 and none of those age 65 or over. 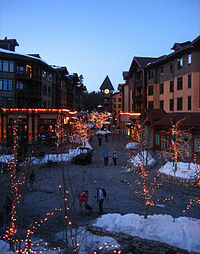 Mammoth Lakes' economy is primarily tourism-based. For example, Mammoth Mountain Ski Resort is the top ski destination in California. A 13% tax is added to the rental of any lodging facility and campgrounds for stays of less than a month. There are more than 4,599 rental units in Mammoth Lakes and the lodging industry generates around two-thirds of the gross revenue of the Town of Mammoth Lakes. As well as the pull from winter extreme sports, Mammoth Lakes also benefits greatly from tourism in the summer from people who visit to camp, hike and fish. The Mammoth Lakes real estate market has gone through ups and downs over the past few decades. In 1980, an earthquake with magnitude of 6.1 on the Richter scale sent area property values plummeting on fears of a potential volcanic eruption similar to the 1980 eruption of Mount St. Helens. A significant real estate surplus formed after this, during which Mammoth Lakes had a total of over 1200 properties on the market. The development of the Mammoth Mountain ski area has had a direct effect on housing in more recent years. The tourist market has led to an explosion of property values. This peaked in 2003 when the median property value reached $750,000. Another peak occurred in 2006 with the sale of the Mammoth Mountain ski area to Starwood Capital Group. As of February 2010, the median listing price was $460,000. This represents a drop of over 38% from the peak reached in 2006. Mammoth Lakes is home to Mammoth Brewing Company and Black Doubt Brewing Company. The municipal government of Mammoth Lakes is of the council-manager type. The town council consists of five members serving staggered four-year terms. A mayor and a mayor pro tem are selected from town council on an annually rotating basis. Law enforcement is provided by the Mammoth Lakes Police Department and fire protection is provided by the Mammoth Lakes Fire Protection District. Emergency medical service is provided by Mono County operating out of Mammoth Lakes Fire Station #1. In the California State Legislature, Mammoth Lakes is in the 8th Senate District, represented by Republican Andreas Borgeas, and in the 5th Assembly District, represented by Republican Frank Bigelow. In the United States House of Representatives, Mammoth Lakes is in California's 8th congressional district, represented by Republican Paul Cook. The Mammoth Unified School District includes the following schools: Mammoth Elementary School, Mammoth Middle School, Mammoth High School, Sierra High School, and Mammoth High School ILC. The Mono County Office of Education offers an alternative high school, the Jan Work Community School, where highly motivated students are allowed to earn credits more quickly than may be earned in a traditional semester. The Mammoth Lakes Library opened in December 2007. Mammoth Lakes receives scheduled passenger airline service year via the Mammoth Yosemite Airport with nonstop propjet flights operated to Los Angeles and seasonally to San Diego by Horizon Air. In addition, United Express operated by SkyWest Airlines operates nonstop regional jet service to San Francisco (SFO) on a seasonal basis. Local and intercity bus service is provided by Eastern Sierra Transit Authority. Yosemite Area Regional Transportation System provides summer bus connections to Yosemite. Various western films have been shot by Mammoth Lakes. Examples include Thundering Hoofs (1924), The Border Legion (1924), Beyond the Rockies (1932), Flaming Guns (1932), The Trail Beyond (1934), Call of the Wild (1935), Moonlight on the Prairie (1935), Royal Mounted (1936), God's Country and the Woman (1937), Cassidy of Bar 20 (1938), Hawk of the Wilderness (1938), Knights of the Range (1940), Melody Ranch (1940), Sierra Sue (1941), The Return of Frank James (1940), Flame of the Barbary Coast (1945), Frontier Gal (1945), and Rose Marie (1954). Meb Keflezighi, 2004 Olympic silver medalist in the marathon and winner of the New York City Marathon in 2009 and the Boston Marathon in 2014. A total of six Mammoth Lakes residents competed in the 2014 Winter Olympics in Sochi, Russia; Kelly Clark, Greg Bretz, John Teller, Trevor Jacob and Stacey Cook represented the U.S. while Kaya Turski represented Canada. Chloe Kim, Winter X Games snowboarder and 2018 Olympic gold medalist. ^ "Town Council". Town of Mammoth Lakes Official Website. Town of Mammoth Lakes. Retrieved July 20, 2018. ^ a b Durham, David L. (1998). California's Geographic Names: A Gazetteer of Historic and Modern Names of the State. Clovis, Calif.: Word Dancer Press. p. 1182. ISBN 1-884995-14-4. ^ "History of Mammoth Mountain, California". Pacific Rim Snow Sports Alliance. Retrieved 2015-06-07. ^ Reed, Adele (1982). Old Mammoth. Mammoth Lakes, California: Genny Smith Books. ISBN 978-0-931378-04-1. ^ "California Courts - Appellate Court Case Information". Appellatecases.courtinfo.ca.gov. 2011-03-23. Retrieved 2016-12-15. ^ "Mammoth Lakes, California Chapter 9 Voluntary Petition" (PDF). PacerMonitor. PacerMonitor. Retrieved 22 June 2016. ^ Thomas, Pete. "Mammoth Lakes, famous California ski town, files for bankruptcy". The GrindTV Log. Archived from the original on July 5, 2012. Retrieved July 3, 2012. ^ Church, Steven. "Mammoth Lakes Bankruptcy Case Ends After Accord in Suit". Bloomberg. Retrieved November 29, 2013. ^ Baxter, Kevin (2012-03-24). 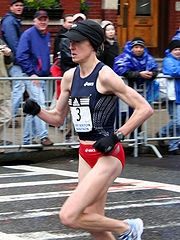 "U.S. distance runners get into tip-mountaintop shape for Olympics". The Los Angeles Times. Retrieved 2013-04-21. ^ "Mammoth Lakes, California Köppen Climate Classification (Weatherbase)". Weatherbase. Retrieved 2019-02-11. ^ "Improved Highway Design Methods For Desert Storms" (PDF). Caltrans. August 2007. Retrieved February 11, 2019. ^ "Station Name: CA MAMMOTH LAKES R.S." National Oceanic and Atmospheric Administration. Retrieved 2013-03-14. ^ "Period of Record Monthly Climate Summary". Western Regional Climate Center. 2010. Retrieved 2011-11-26. ^ "2010 Census Interactive Population Search: CA - Mammoth Lakes town". U.S. Census Bureau. Retrieved July 12, 2014. ^ Sahagun, Louis; Roger Vincent (October 5, 2005). "Hotel Mogul to Buy Mammoth Ski Area". Los Angeles Times. ^ "Mammoth Mountain Median Listing Price". Zillow. ^ "Town Council Overview". City of Mammoth Lakes. City of Mammoth Lakes. Retrieved September 29, 2014. ^ "Statewide Database". UC Regents. Retrieved December 1, 2014. ^ "California's 8th Congressional District - Representatives & District Map". Civic Impulse, LLC. Retrieved October 1, 2014. ^ "Mammoth Unified School District". Retrieved 2017-03-14. ^ "Jan Work Community School". Monocoe.org. 2015-03-19. Retrieved 2016-12-15. ^ "Mammoth Lakes - Mono County Free Library". Monocolibraries.org. 2012-12-20. Retrieved 2016-12-15. ^ Gaberscek, Carlo and Kenny Stier (2014). In Search of Western Movie Sites. Lulu Press, Inc. Pages 186-188. ISBN 9781312625020. ^ Jerry Rice (January 29, 2014). "Team USA going to Sochi Olympics draws 6 from Mammoth Lakes". SnoWonder. Retrieved March 6, 2014. ^ Stephen Krcmar (February 3, 2014). "Small town, big Olympians; Mammoth Lakes home base for six Sochi athletes - Quiet California resort provides big training opportunities". Grind TV. Retrieved March 6, 2014. Wikivoyage has a travel guide for Mammoth Lakes. This page was last edited on 31 March 2019, at 02:27 (UTC).